Always stay in your car when driving in a game park. Only get out at designated "hides" and follow the rules that will be posted. I have personally known of several fatalities that have occurred because a hapless tourist has wandered out of his vehicle, camera in hand, to get a closer shot of an elephant or lion. It may sound silly, but it happens. Don't stand up or stick anything out of the car. 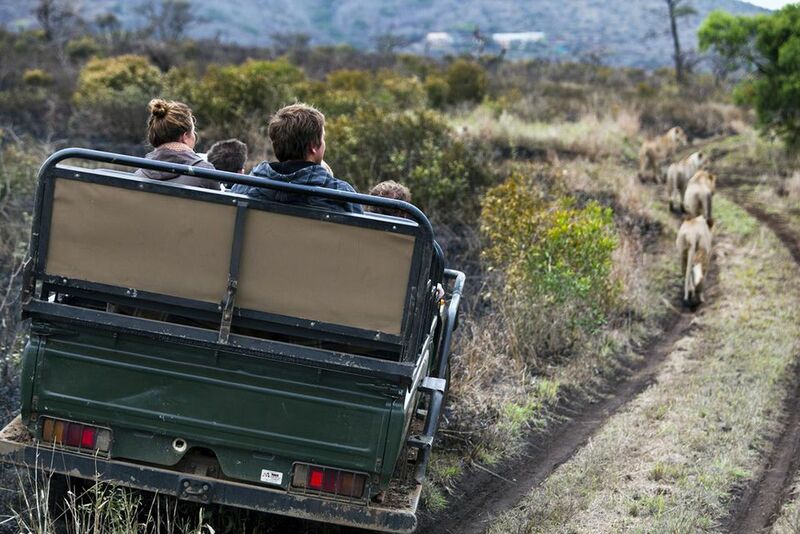 Many safari vehicles are open-topped and the wildlife is generally accustomed to these. But, if you stand up or wave something around on the side, some animals will get annoyed and consequently aggressive. I have been charged at by elephants in an open vehicle, believe me, it was a little too exciting. You also have to remember that poaching is rife in many areas and anything that looks like a gun can trigger a very nasty response from a wild animal. Drive slowly and carefully. During the wet season, the grass can get quite high and it's not always possible to tell when a large buffalo or elephant will decide to step into the middle of the road. Remember, you have to stop if this happens. Buffalos and elephants are not in the least bit afraid or impressed by you or your car. Keep your windows up. If you are in a car with windows, it's better to keep them closed. I've been harassed by baboons on several drives through the more popular game parks. They are so habituated to cars they are not afraid to leap up on it and dent your roof. You really don't want one inside your car. Try and stay downwind from the animal. If the animal catches your scent it will know you are there and you have no idea whether this will make it angry or afraid. If an animal you approach looks hostile make sure you are not in the way of its escape route. Give the animal a clear birth and don't make any noise to further aggravate the situation. Walk away slowly. If you encounter an animal that doesn't like your presence move back slowly and quietly. Avoid swimming in rivers or lakes unless you are absolutely sure there are no hippos or crocodiles. Hippos are actually the most dangerous of all the big animals. They feed on the banks of the river and if they sense danger will charge and attack whatever lies in their path in order to get back to the safety of the water. If you are camping out in the open always make sure you have something covering you even if it's just a mosquito net. Hyenas like to check out camps for leftover food and are especially attracted to protruding objects, so keep your feet and nose inside that tent or net. Always wear boots and socks when walking around the bush. There are plenty of venomous snakes and scorpions around that could bite you. Don't walk around at night in areas where you know there is wildlife present that can be potentially harmful to you. That includes the beaches around lakes where hippos graze between tents on a camping safari and in even in towns. Hyenas wander around freely in the capital city of Lilongwe in Malawi, so always be cautious.